Sub-Title: by Speke and Grant in 1863. Measurement Notes: Prme meridian Greenwich. Notes: Associated with Book ID 597. The dimensions are referred to the main map to the left. On the right, there is a map of 34 cm height and 12.8 cm width; scale 1:1162000. At the bottom of the maps, there are drawings of "Shape of Solitary Hills of Sandstone in the Deserts of Bahr-Hud-ab and Bahr-Belaama." On the right margin of the map, there is a section reporting the elevation of the region. 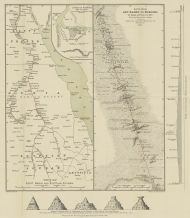 The title is "Section of Desert between Abu Hamed and Korosko." The map is in poor condition, since it shows cuts along the main folds.